Dodgers outfielder Yasiel Puig is in the news again, but not for a reason he'd like. From treating Little Leaguers to a VIP experience at Dodger Stadium to visiting kids at Children’s Hospital Los Angeles alongside Lakers star Pau Gasol, Dodgers outfielder Yasiel Puig has done plenty of good this offseason. But on Saturday morning the Dodgers’ outfielder was arrested after being clocked going 110 mph in a 70-mph zone in Florida. A news release from the Florida Highway Patrol said a white Mercedes driven by the 23-year-old Cuban defector was pulled over around 9:30 a.m. Saturday. 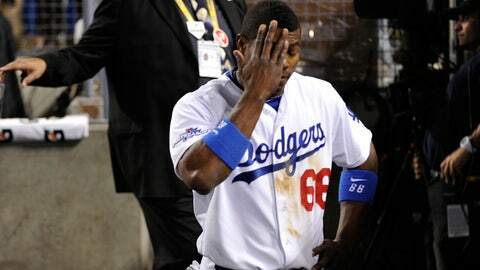 The Dodgers issued a statement Sunday that said Puig’s behavior ”is a very serious issue to us.” The Dodgers said they would continue to educate the 23-year-old Cuban defector and strive to further develop his growth off the field. Puig, who finished second in NL Rookie of the Year voting after hitting .319 with 19 home runs in 104 games, recently had reckless driving and speeding charges dismissed in Tennessee after completing 12 hours of community service. Puig was caught going 97 mph in a 50-mph zone in April while with the Dodgers’ Double-A affiliate in Chattanooga.